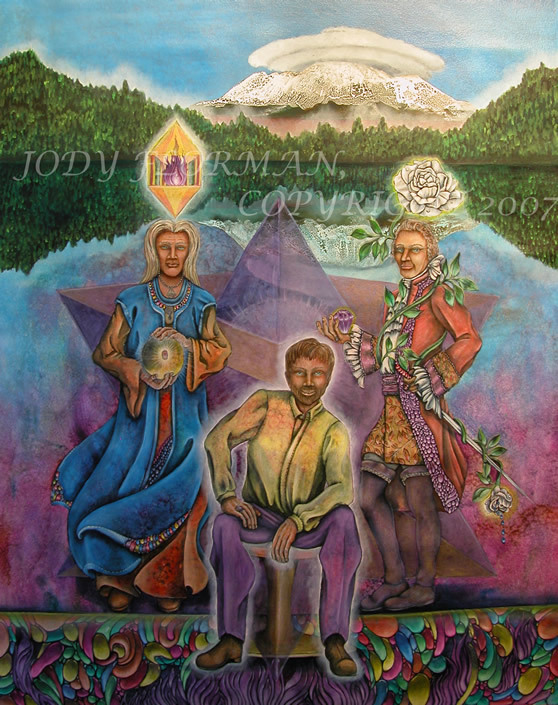 In 2004 I was at a channeled spiritual event and was asked to start painting the Ascended Masters. It entailed re-learning quite a few things I had forgotten over the years. So, for the next years I did just that. Some were commissioned, most were a result of Visions I had during my meditations. It has been a fascinating adventure that will continue, and I am so very grateful! Gaia and the New Earth. Egg tempera and oil on board. 30" x 35" The manifestation and creation of a new alignment, as we transition from the "what is", and write our new story of the "what will be". Lady Palais Athena. Egg tempera and oil on board. 35" x45" "I Accept, I Receive, I Believe, I Embody, I Intuit"
Mary Magdalene. Oil on canvas. 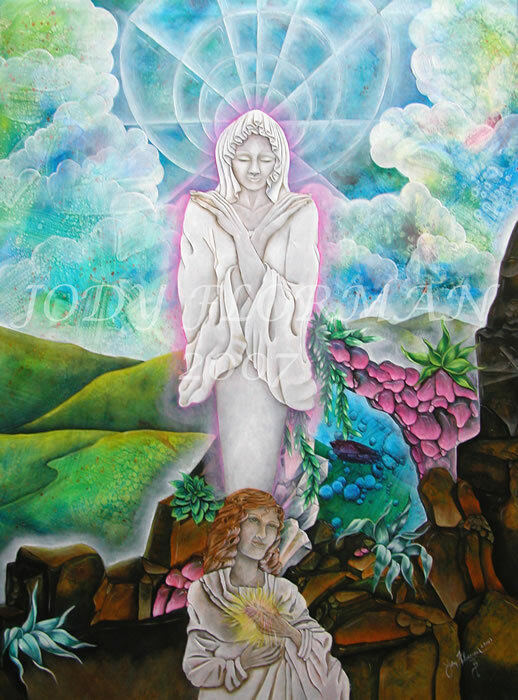 34" x40" Mary Magdalene in this energetic is a Modern Mystic. She shows you how to stand in your power, align with your Divinity and hold your focus, for as long as it takes to receive your gifts. Build a rainbow bridge to the Truth and hold the focus of your intention, for the Truth will be revealed and Love will prevail. Mother Mary. Oil on canvas, 34" x 40" Mother Mary is based on a vision I had at the Grotto in Lourdes, France and brings forth Comfort and Joy. With the completion of this painting I had a very important understanding. I am/we are never alone. There is always Divine Assistance and support available, no matter the size of the task at hand or the complexity of the path to travel. The support is there for the asking. You have the option to choose this help and support at any time. Lady Nada. 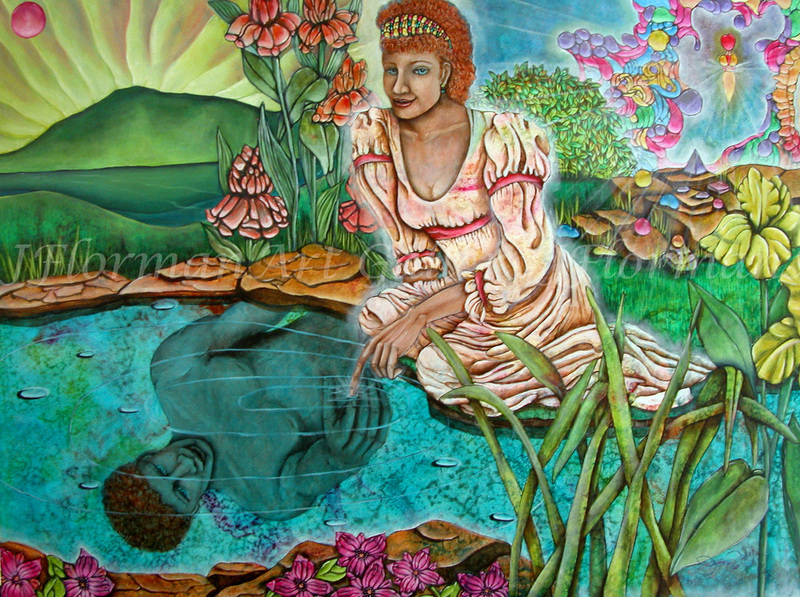 Oil on canvas, 340" x 30" Lady Nada brings forth Qualities and Virtues. As you bring forth your qualities in alignment with your Divine Plan, call on the angelic Virtues to help you ground your qualities into being. 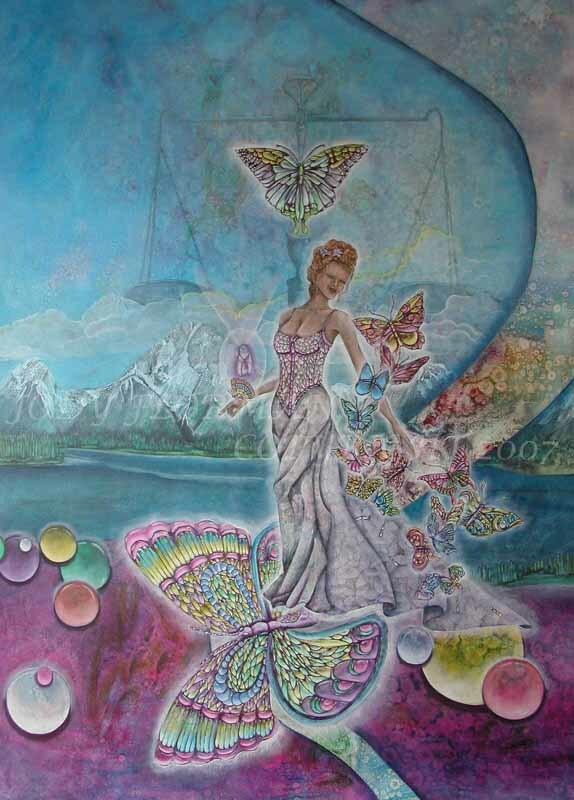 Lady Nada also brings forth Balance creation. As she, and her lineage, dream and sing her world into existence, (pictured here at her retreat at Lake Titicaca, Peru) she flows through the quantum shifts of existence. She is everything and nothing simultaneously. Lady Nada reminds us of the true meaning of Humility: Knowing your place in the world and taking it. Lady Rowena. 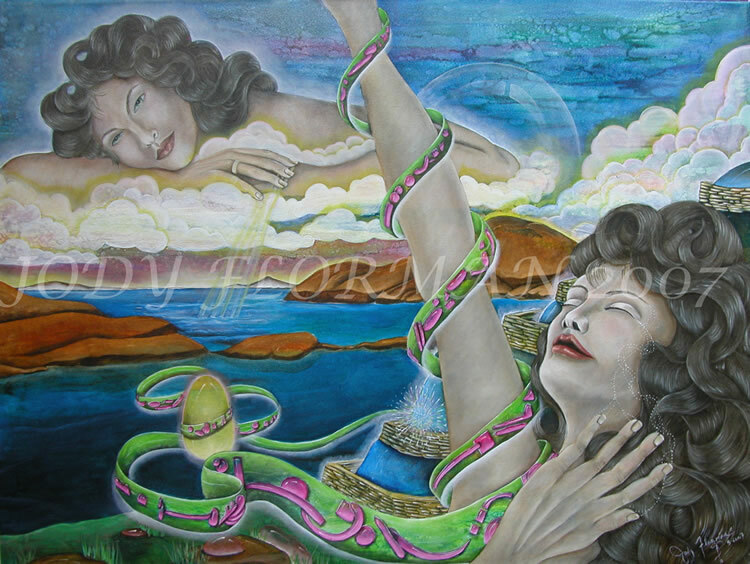 Oil on canvas 40" x 30" Once found fictionalized in history, Lady Rowena integrates male and female. She provides a focus for the balance of feminine love in relationship, healing and harmonizing the history of relationship. Lady Portia. 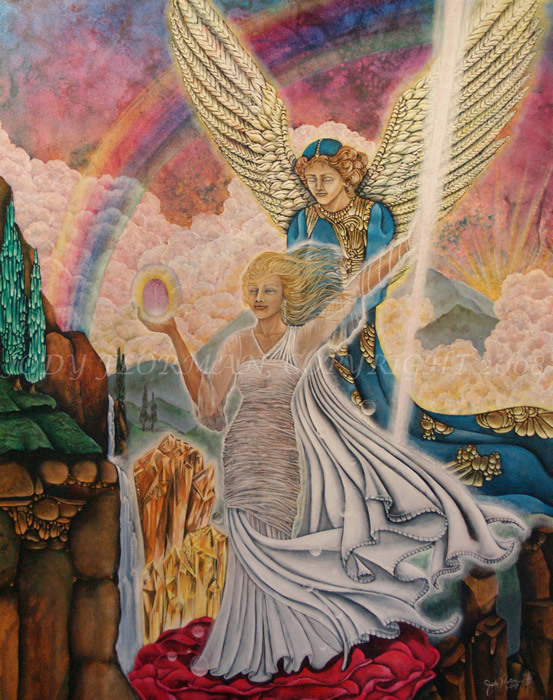 Oil on canvas, 30" x40" The Divine partner to Saint Germain, Lady Portia graces us with her transformational and balancing energies to bring about the realization of Divine Justice in our world. Saint Germain. Oil on canvas 30" x 40" Chohan of the 7th ray (the Violet Ray). Twin flame of Lady Portia. Alchemist of transformation. 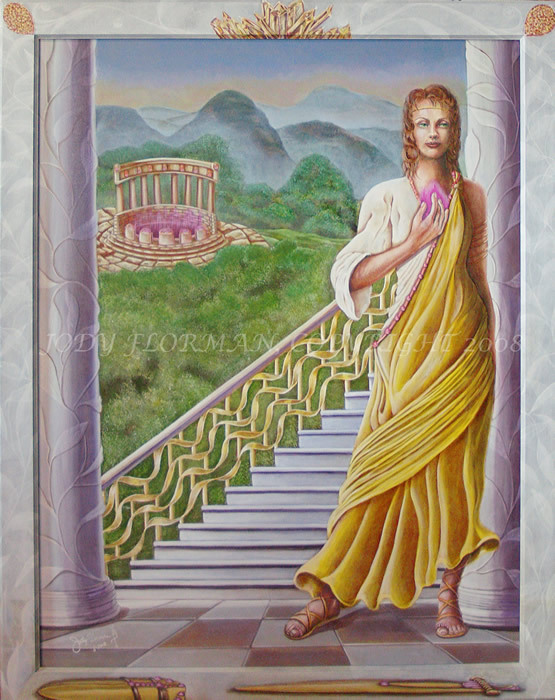 Teacher of the violet flame, divine manifestation, prosperity and Universal Law. Djwhal Khul. 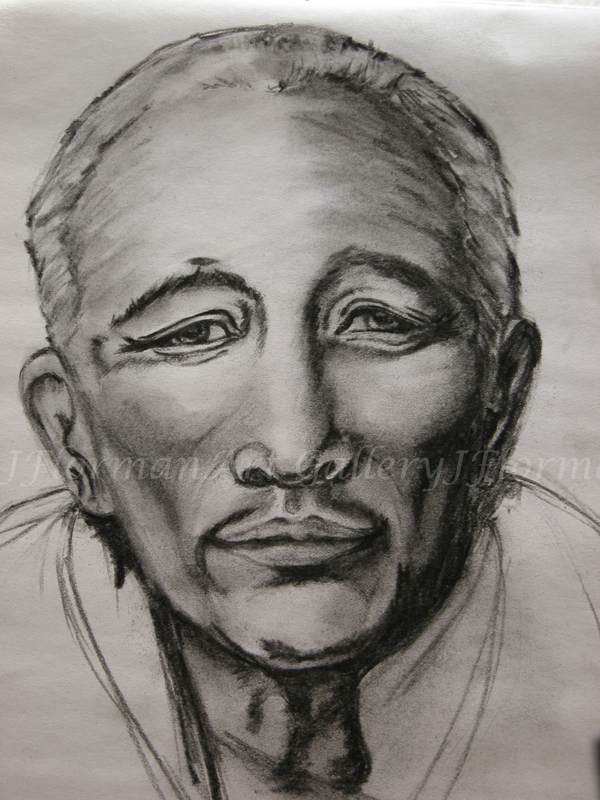 Charcoal on paper, 8" x10" Djwhal Khul is also known as 'The Tibetan'. He is one of the Masters of Wisdom, notably channeled by Madam Blavatsky and Alice Bailey in the latter half of the 19th century. This two sided, piano hinged screen is painted in a traditional Tanka style. Djwhal Khul. Oil on wood. Djwhal Khul is also known as 'The Tibetan'. He is one of the Masters of Wisdom, notably channeled by Madam Blavatsky and Alice Bailey in the latter half of the 19th century. This two sided, piano hinged screen is painted in a traditional Tanka style. 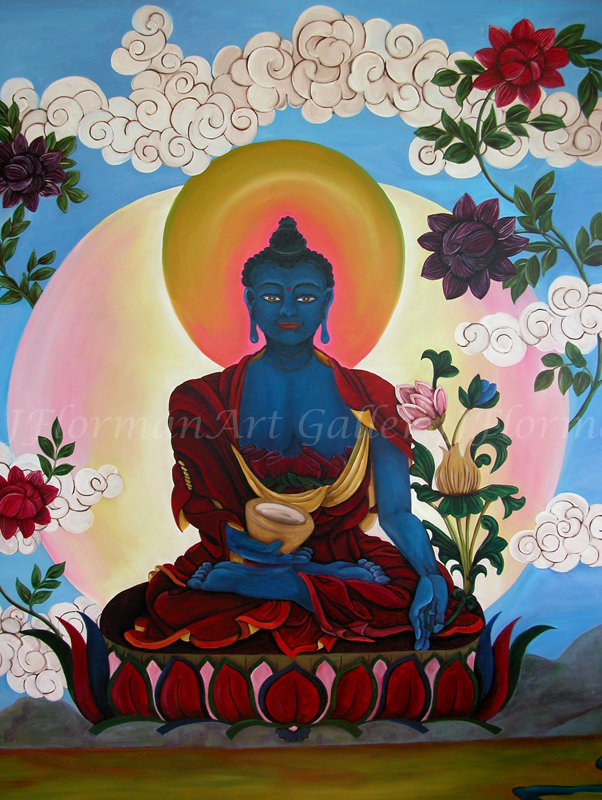 The Blue Medicine Buddha. The Healer aspect of the Buddha, in the Tibetan Buddhist tradition surrounded by the 8 auspicious symbols. 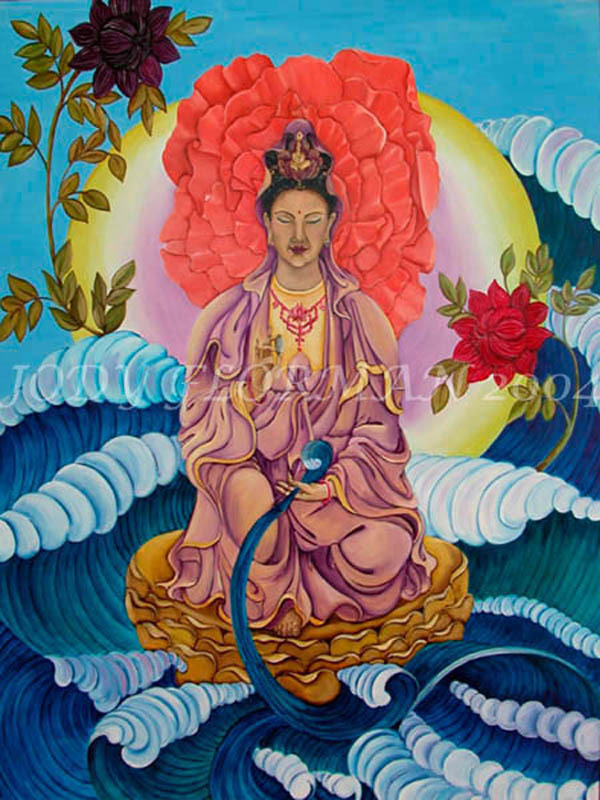 Lord Maitreya. Oil on canvas, 30"x 40". Maitreya is the personal name of the being who holds the office of 'The Christ'. He is the leader of the Spiritual Hierarchy and holds the focus of the Christed Light upon planet Earth. Sananda. 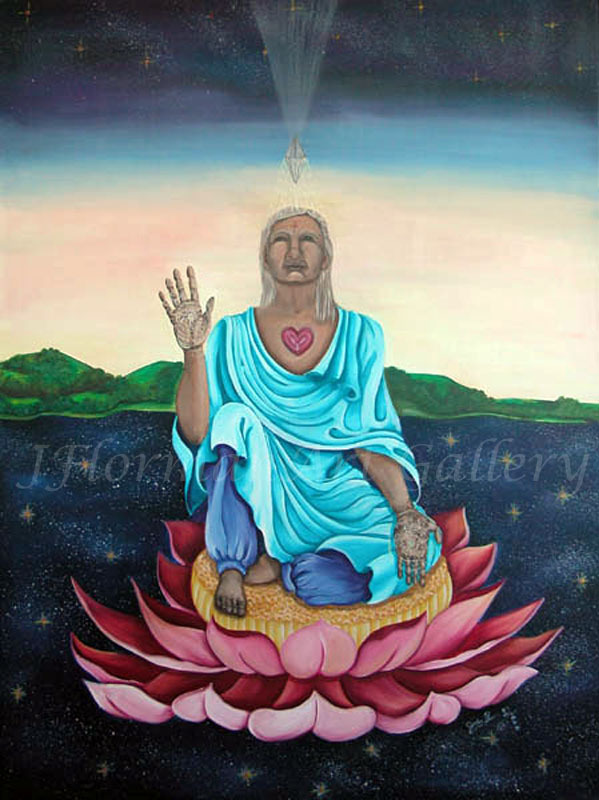 Oil on canvas, 30" x40" Sananda is the Ascended Master who heads the sixth ray department of the Spiritual Heirarchy, of Devotion to Divine Ideals. He has been know as Master Jesus who set an example for the potential of all mankind. Sanat Kumara, Vywamus and Lenduce. 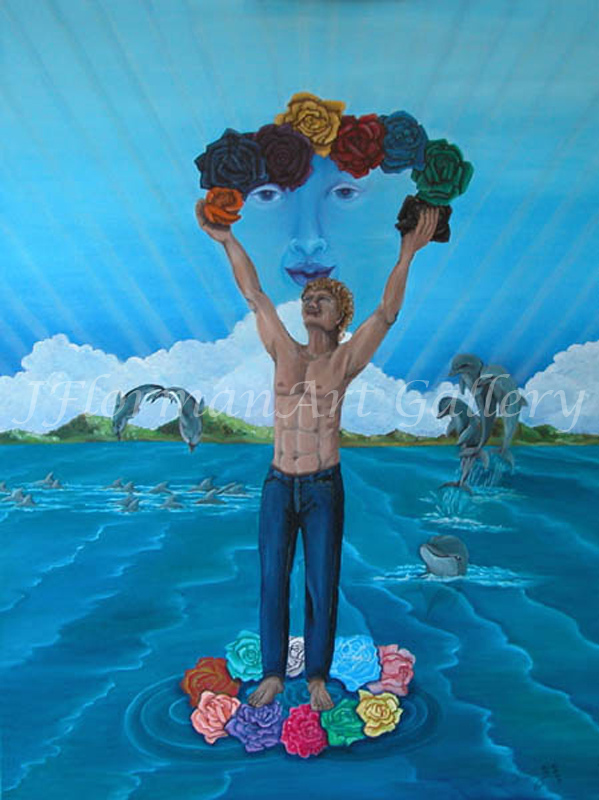 Oil on canvas, 30" x40" Sanat Kumara is the being whose consciousness en-souls the planet (central figure). 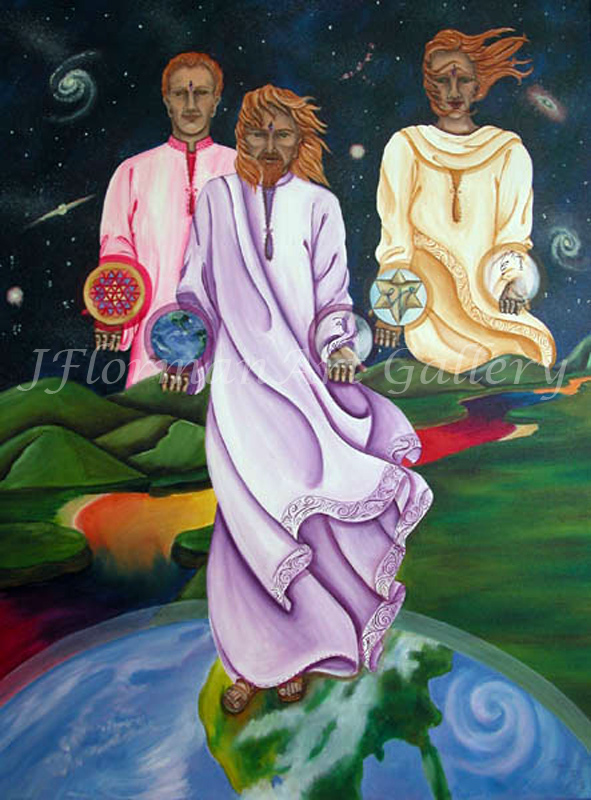 His higher aspect is Vywamus, (left of center) who deals with structure, and his tri-fold aspect, Lenduce (right of center) who deals with time. 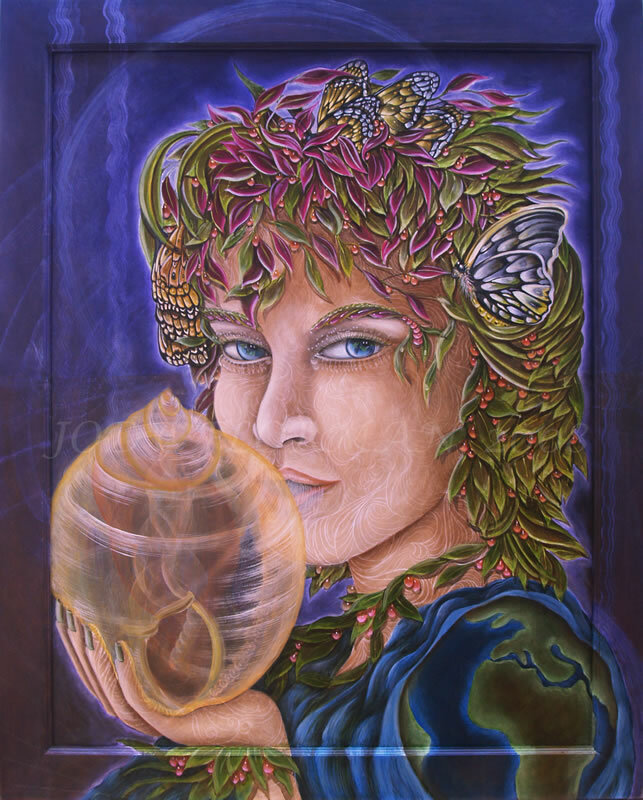 Gaia, Mother Nature. 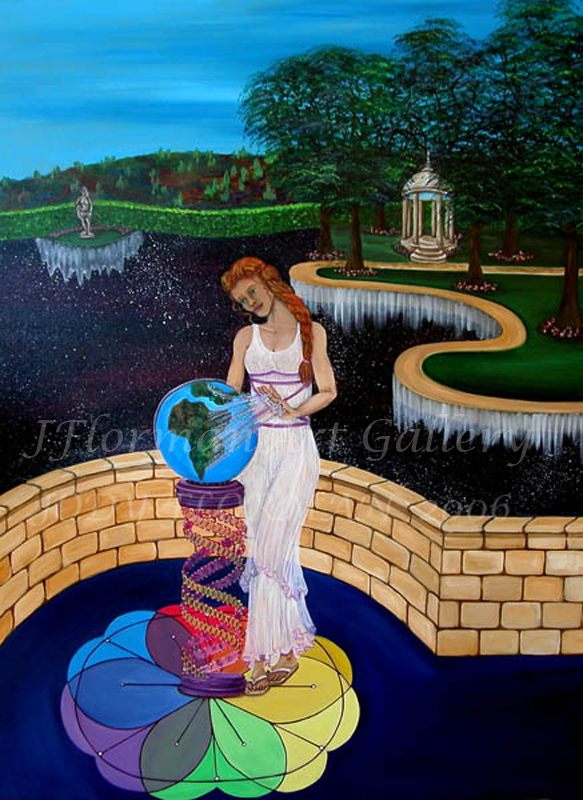 Oil on canvas, 30" x 40" Gaia created the 'Earth' maintaining the 'form' aspect of the planet through which evolving consciousness can express, by directing the many forces of nature, ie. Elementals, Devas and various nature spirits. Everything that is, is nature. Quan Yin. Oil on board, 30" x 38" Quan Yin is known as the 'Goddess of Compassion', the female aspect of the Buddha. 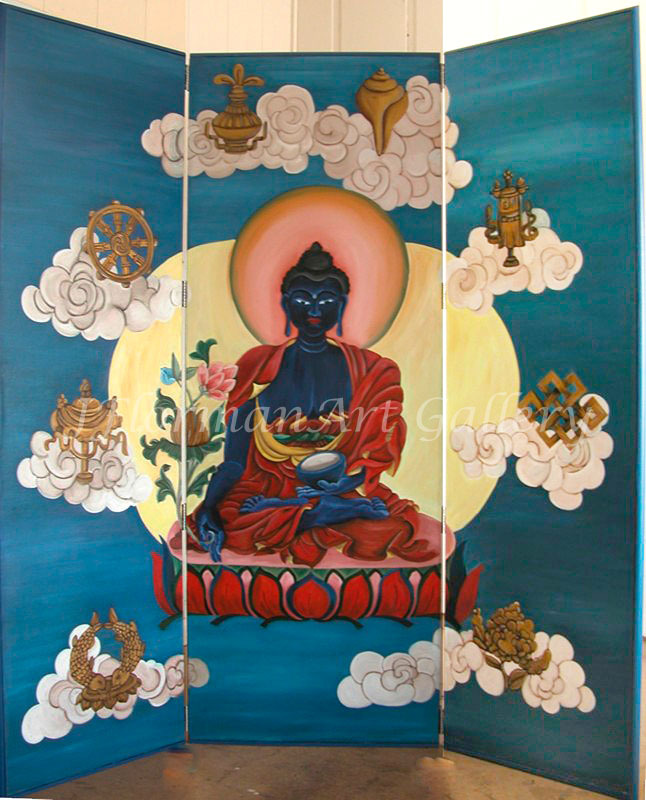 The Blue Medicine Buddha. 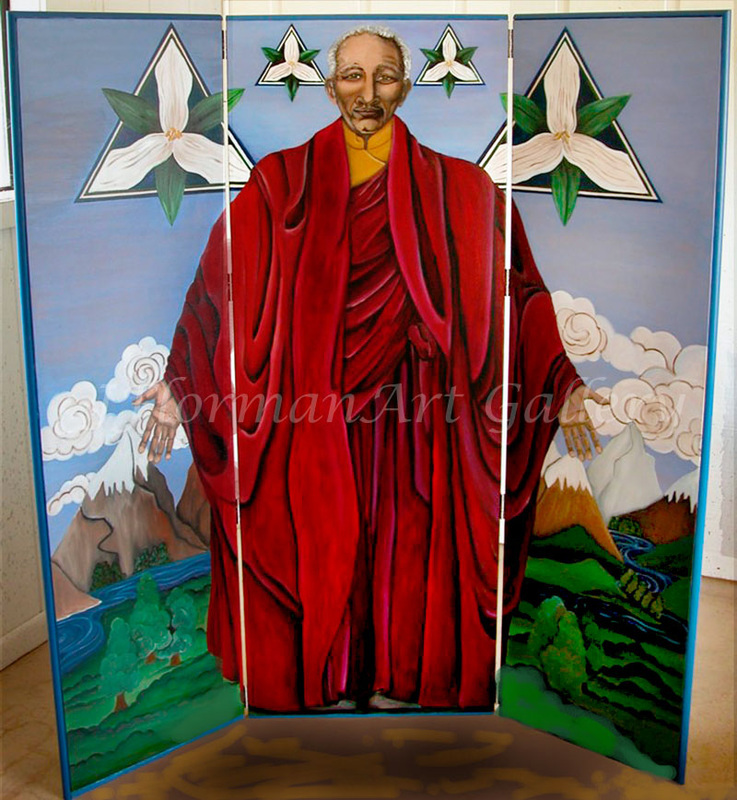 Oil on canvas, 48" x48" The Blue Medicine Buddha is considered the Healer aspect of the Buddha, in the Tibetan Buddhist tradition.